Even with the evolution of chemotherapeutic procedures and agents, chemotherapy may cause certain side effects that impair the patients’ quality of life. The aim of this review is to isolate and describe the oral side effects arising only from chemotherapy and focus on the dentist’s contribution to their management. This paper comprises an extensive literature review of the main side effects affecting the oral health status of patients’ undergoing chemotherapy procedures. In addition, it describes the dentist’s contribution in the treatment of such patients before, throughout and after antineoplastic therapy. In conclusion, the oral cavity is a usual site of discomfort and pain caused by chemotherapy, making the dentist’s contribution to the patient’s relief imperative. This paper reports a case of a recurrent periapical cyst treated with enucleation of the lesion, apicoectomy, and root end obturation on a lower left first molar. In the case of conventional root canal treatment failure, non-surgical retreatment is the preferred option in most of the cases. Several factors such as a complex root canal system or previous procedural accidents may impede the success of non-surgical retreatment. The authors have performed root-end resection and preparation under local anesthesia on a lower left first molar; The root canal filling is placed within the new cavity to close the path of communication between the infected root canal system and periradicular structures with an intermediate restorative material. The lesion was fully enucleated and sent for histopathology. The 29-year-old female patient was followed up at 2 weeks, 3 and 6 months presenting as a functional and symptomless tooth. Radiographic findings showed a clear and progressive refilling of the cavity with bone. All these factors highlight a positive prognosis for the tooth after periradicular surgery, which is now considered a valid treatment to keep the tooth as a functional unit in the oral cavity. Aim: The purpose of the study was to evaluate the effect of artificial accelerated aging on surface roughness and color stability of three recently introduced CAD/CAM materials. The hypothesis was that artificial accelerated aging would have an effect on surface roughness and color stability of tested materials. 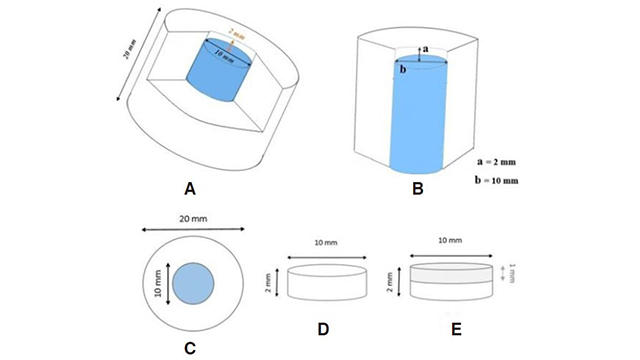 Methods: A total of 21 ceramic discs were fabricated in this study, including translucent zirconia (InCoris TZI) and resin nano ceramic (Lava Ultimate) ceramic blocks for CAD/CAM and a set of bi-layered discs made of a zirconia CAD/CAM substructure (inCoris ZI) with VM9 hand-layered feldspathic veneering. Initial surface roughness measurements using a stylus profilometer and color measurements using a spectroradiometer were carried out. All specimens were subjected to artificial aging by means of a weathering process in a Weather-O-meter for 300 h. Additional surface roughness and color measurements were again carried out after artificial aging of the specimens. The Wilcoxon Signed Rank Test was conducted to determine significant differences in surface roughness among the 3 groups (α = 0.05). Results: Lava ultimate specimens showed a statistically significant difference in surface roughness before and after artificial accelerated aging (P = 0.028). There was no statistical significance in surface roughness of both the translucent zirconia TZ1 (P = 0.499) and the InCoris ZI with VM9 veneering (P = 0.398) specimens before and after aging. The amount of color change in the 3 ceramic groups was also not significant. Conclusion: Artificial accelerated aging did not affect the color stability of any of the 3 ceramic groups, however, it caused a significant decrease in the surface roughness of the resin nano ceramic group. For thousands of years, humans have been using herbal remedies to cure and prevent various illnesses. Out of many herbal products, neem has numerous properties which have promoted its use in both the medical and dental fields. Use of neem has been mentioned in alternative medical specialties, such as Ayurveda, Unani and Homeopathic medicine. Endodontic therapy aims to eliminate microorganisms from the root canal system. In endodontics, irrigating solutions play a significant role because of their antimicrobial activity. Their use becomes even more significant when handling infected endodontic cases where a plethora of microbes is invading the root canal system. However, one has to be extremely cautious while using irrigating chemicals in endodontics, owing to their toxic effects, in case they extrude into periradicular tissue. For this very reason, the use of herbal irrigating solutions such as neem is being advocated worldwide. 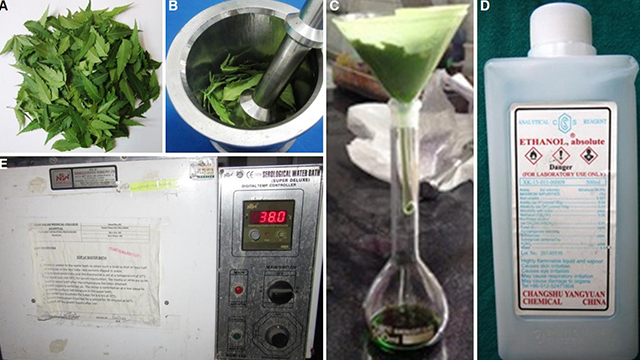 This article highlights the origin, taxonomy, chemical composition, and medicinal properties of the neem tree and its potential use as an irrigating solution in the field of endodontics. Aim: The aim of this study was to compare the shear bond strength (SBS) of various adhesive systems to a bioactive dentin substitute Biodentine® with different time intervals. Methods: Three hundred and fifty cylindrical acrylic blocks with a hole (4 mm diameter and 2 mm height) were prepared. The holes were filled with Biodentine®, and the specimens were allocated into 5 main groups according to waiting times (group 1, 12 min; group 2, 24 h; group 3, 48 h; group 4, 72 h; and group 5, 96 h). All specimens were stored at 37 °C with 100% humidity during the waiting time. Then each group was divided into 7 subgroups of 10 units each: subgroup 1, Prime&Bond NT™; subgroup 2, Single Bond Universal (self-etch mode); subgroup 3, Single Bond Universal (etch and rinse mode); subgroup 4, All-Bond Universal™ (self-etch mode); subgroup 5, All-Bond Universal™ (etch and rinse mode); subgroup 6, G-aenial Universal Bond™ (self-etch mode); and subgroup 7, G-aenial Universal Bond™ (etch-and-rinse mode). After the application of adhesive systems, compomer Dyract XP Bond® was applied over Biodentine® SBSs were measured using a universal testing machine. After the SBS test, the fractured surfaces were examined under a stereomicroscope at 25× magnification, and the data were analyzed with Kruskal-Wallis and Mann-Whitney U (with Bonferroni correction) tests. Results: Biodentine® exhibits lower shear bond strength values in the 12 min groups. No significant differences were observed between self-etch or etch-and-rinse bonding modes. Conclusion: A 24-h waiting period after the mixing of Biodentine® could be useful to obtain higher SBS measurements. Also, similar SBS values were observed for the universal adhesives regardless of application mode. 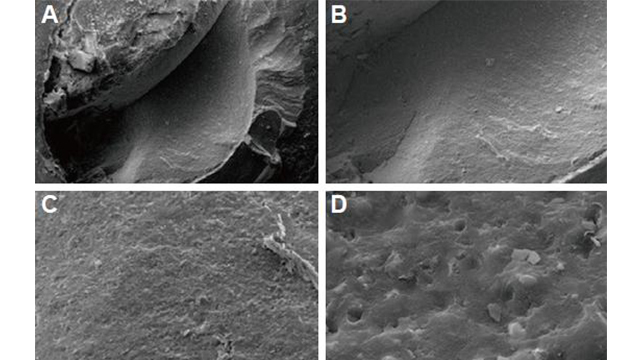 Aim: The purpose of this in vitro study was to determine the optimum margin thickness which allows more conservative tooth preparation, thus giving space for the veneer material and to evaluate the effect of the processing technique on fracture resistance of IPS e.max® copings. Methods: Forty all lithium disilicate copings were divided into 2 equal groups according to the construction technique; twenty copings each (n = 20) per group. Each group was further subdivided into 2 equal subgroups according to the coping margin thickness; 0.5 mm and 0.7 mm (n = 10/subgroup). Two dies were prepared with 5 mm cervical diameter, 60° axial taper, and 5 mm occluso-cervical height with the non-anatomical occlusal table. Copings were constructed using heat pressing and CAD/CAM milling techniques, and were cemented on epoxy dies using RelyX™ Unicem resin cement. Samples underwent pre-loading in a cyclic manner equivalent to the average masticatory cycle. Afterward, samples were loaded until fracture using the same computer controlled material testing machine. Data were analyzed for each group using one-way analysis of variance (ANOVA) followed by a Tukey’s pairwise post-hoc test between the 2 coping thicknesses. P values which were 0.05 or less were considered statistically significant. Separate student t-tests was performed to detect the significance between the main groups. 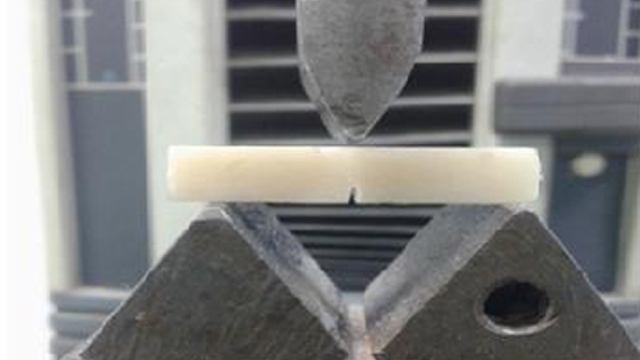 Finally, a two-way ANOVA was done to evaluate the effect of the processing technique, and the coping thickness on the fracture resistance. Results: Effect of the construction technique revealed significant (P < 0.05) influence on the fracture resistance mean values of the ceramic copings (CAD > Press). Effect of thickness showed significant (P < 0.05) influence on fracture resistance mean values as well (0.7 mm > 0.5 mm). 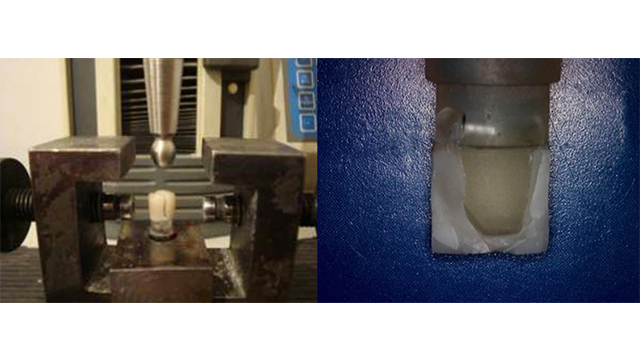 Conclusion: Within the limitations of this study, the following conclusions could be drawn: the CAD/CAM technique showed improved strength over the heat pressed technique, regardless of the margin thickness of the ceramic coping, 0.5 mm thickness coping, constructed using both pressing and milling techniques, has sufficient strength to withstand the average masticatory forces in the premolar region (222 to 445 N). Aim: The aim of this study was to evaluate the effect of asthma on dentoalveolar morphology in the developing child. Methods: This study was conducted on 50 asthmatic Egyptian children and 50 non-asthmatic Egyptian children. Each child’s dental casts of the maxilla and mandible were analyzed. The upper and lower intercanine width, the upper and lower inter-molar width (UIMW-LIMW), the upper and lower arch length, and the palatal depth were determined. Results: Children with asthma demonstrated higher mean values in more than one of the parameters measured when compared with the mean values of non-asthmatic children for both genders. In general, the UIMW of asthmatic children had lower mean values when compared with the mean value of non-asthmatic children, except when compared regarding gender. A Student t-test noted a significant difference in UIMW and LIMW in male children. Conclusion: Asthma has an effect on upper and lower dental arch dimensions in both genders. Aim: To evaluate a novel approach for reinforcing 2 types of provisional restoration materials [polymethylmethacrylate (PMMA) and bis-acryl resin] with different concentrations of silica gel powder (0%, 0.5%, 1%, 1.5%, 3%, 5%, 10% by weight). Methods: A total of 60 rectangular fracture toughness specimens were prepared in this study according to the ISO 13586 Standard with dimensions of 2 mm × 5 mm × 25 mm. The specimens were divided into 2 groups according to the materials used PMMA or bis-acryl. Each subgroup was divided into 6 subgroups according to the different silica gel concentrations (0%, 0.5%, 1.5%, 3%, 5%, and 10% by weight) added where the 0% subgroup was used as a control group. Fracture toughness for the specimens was determined by loading the specimens in a universal testing machine. Results: The results showed that addition of 0.5% by weight of the silica gel powder for PMMA recorded the highest mean value (2.69 ± 0.08 MPa•m1/2) and this was statistically significant. Conclusion: Within the limitation of this study it was concluded the addition of 0.5% by weight silica powder gel could increase the fracture toughness of PMMA. 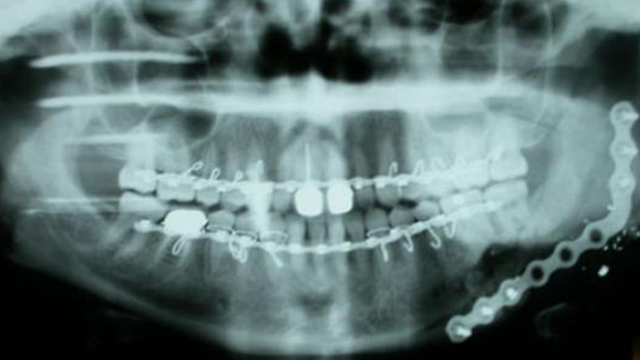 Aim: To introduce bifocal distraction osteogenesis (BDO) and subsequent endosseous dental implant placement as an overall method for reconstruction of complete maxillary and mandibular segmental defects. Methods: Within the authors' whole series, 29 patients showing bony segmental defects within the maxillofacial skeleton underwent BDO. The authors focus on 3 patients who were further rehabilitated with endosseous dental implants into the distracted bone. Results: The overall BDO success rate was 79%. 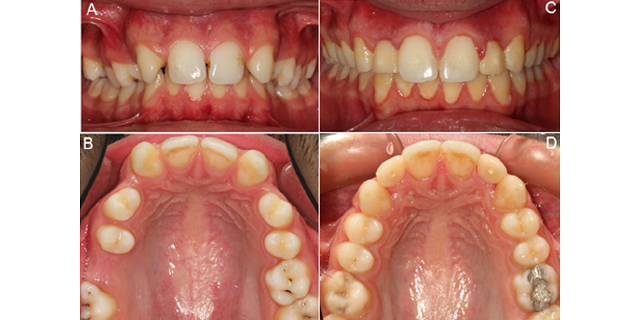 The 3 reported cases underwent dental implant rehabilitation with 4, 6, and 5 endosseous dental implants, respectively. 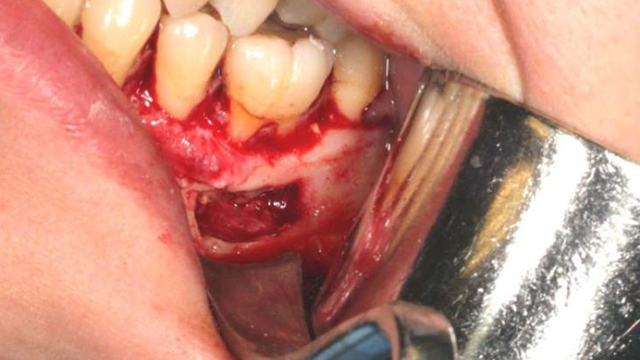 No relevant complications were observed, except for intraoral scarring in one patient, and pain at the end of the distraction phase in another patient. Adequate attached gingival tissue was obtained for maxillary and mandibular distracted bone in all the cases. 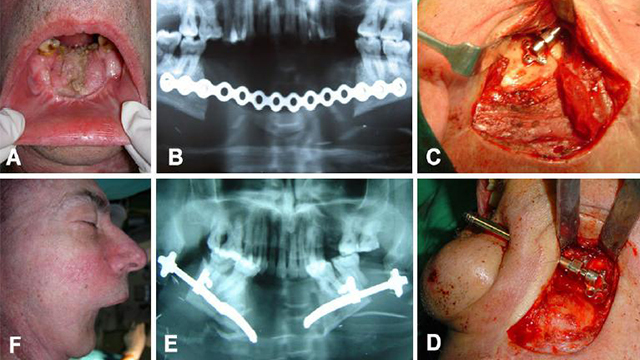 Conclusion: Three cases of segmental maxillo-mandibular defects that have been reconstructed by bifocal distraction osteogenesis and further rehabilitated with endosseous dental implants. Surgeons must keep in mind this technique as an alternative to bone microsurgical reconstruction in cases in which free flaps are contraindicated or extended surgical time has to be avoided. Papillary cystadenocarcinoma (CAC) a rare malignant salivary gland tumor which commonly arises in the major glands, mainly the parotid, and less frequently in the minor salivary glands. Localization in the sublingual salivary gland is very rare. The authors present a case of papillary CAC originating from the right sublingual gland in a 78-year-old female. A review of the literature revealed only 3 previously published detailed cases (in addition to 2 cases as part of larger series) of papillary CAC of the sublingual gland. The salient demographic, clinical, and histopathologic findings of papillary CAC, as well as its surgical treatment, are discussed. In straight wire pre-adjusted orthodontic fixed appliances, the information required to position the teeth in the three axes is included in the placement of brackets at the facial axis point (FA). The accuracy of bracket placement is mandatory for this technique because any dissimilar approach will not fully satisfy the functional requirements to obtain an ideal occlusion with a correct posterior disclusion. Thus, this article aimed to provide a technical note to obtain a Customized Bracket Placement Chart to achieve an accurate indirect bracket placement involving the temporomandibular joint evaluations. 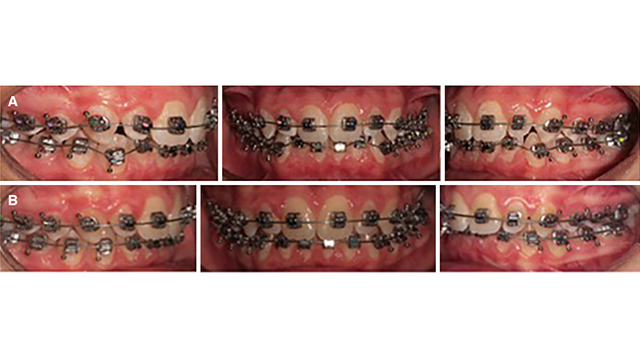 The American Board of Orthodontics, the OBI Bioesthetic Dentistry, and the American Academy of Cosmetic Dentistry criteria were used as guidelines to discern a Customized Bracket Placement Chart in a clinical case. Reference points and lines were drawn on the study models for straight wire indirect bracket placement using FAQ.FIX®. The Customized Bracket Placement Chart created with the use of FAQ.FIX® may represent a valuable method for planning a correct indirect straight wire bracket placement. This chart reduces bracket positioning errors, treatment time, patient chair time, and the number of appointments regardless of the operator skill, better focusing on mandibular movements during occlusion. Aim: This article aims to present the development of the concept, the design, and the implementation of the teaching of dental ergonomics in the program for undergraduate dental students within the process of reforming the dental curriculum at the Faculty of Dental Medicine of Sofia, Bulgaria. Methods: A documentary analysis covering the process of implementation and teaching of dental ergonomics to dental students, as a unique teaching module within the Department of Public Dental Health, was completed. The data analyzed was grouped as follows: (1) an overview of the new dental curriculum, organized to answer the European mobility context; (2) the development of the concept and introduction of the disciplines in the program of dental public health; (3) a module of dental ergonomics; and (4) the prospective fields of progress and improvement of teaching of dental ergonomics to undergraduate dental students. Results: The module of dental ergonomics was introduced into the program of public dental health as part of the reformed dental curriculum to conform with the EU membership of Bulgaria (2006-2007). It comprises 4-5 major topics relevant to the dental practice and the dental profession. The teaching methods are still under development as lecturing is done outside the clinical settings and demonstrations are offered by trained volunteer students in clinical settings. Conclusion: The teaching of dental ergonomics at the Sofia dental school is still under development. The need for integration of dental ergonomics into the dental curriculum was identified by teachers and students. The position of the school board is important to facilitate the efficient cooperation between clinical and public health departments and to connect preclinical and clinical courses in the dental curriculum. Aim: The study was to correlate the survival of a group of Sri Lankan betel quid induced oral cancer patients with the expression patterns of five cancer stem cell (CSC) markers namely ALDH1, Sox-2, Bmi-1, C-met, and Oct-4. Methods: Archival tissues of 140 oral squamous cell carcinomas (OSCCs) were stained with CSC markers, ALDH1, Sox-2, Bmi-1, C-met, and Oct-4. Survival analysis was performed with SPSS version 20, using Kaplan-Meier survival curves and significance with chi-square test and Breslow’s (generalized Wilcoxon) test. Results: Immunohistochemical investigations revealed 55.7%, 58.6%, 40%, 34.6%, and 31.4% of OSCCs showing ALDH1, Sox-2, Bmi-1, C-met and Oct-4 expression respectively. ALDH1 positivity was significantly associated with nodal metastasis (X2 = 4.6; P = 0.03). 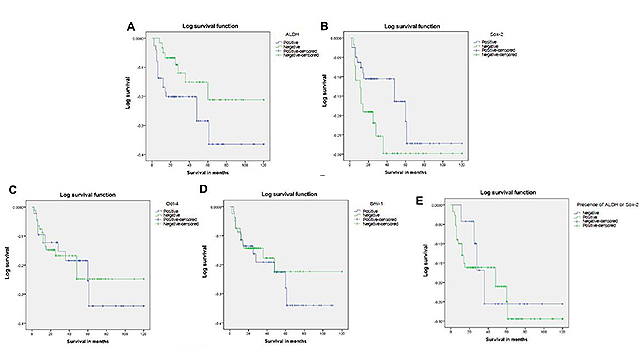 Although it did not reach statistical significance, ALDH1 expression was also correlated with poor survival (P = 0.06). No statistically significant findings could be observed when the expression of other CSC markers were correlated with nodal metastasis and survival (P > 0.05). Conclusion: Out of the five CSC markers investigated, only ALDH1 showed promise as a potential marker to predict nodal metastasis and survival in the present study sample of OSCC patients. The reconstruction of boney defects of the mandible are a challenge in surgical therapy despite advances in bone grafting. 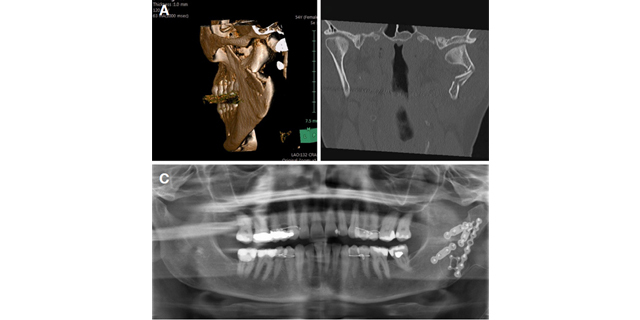 This case study details a 30-year-old female who sustained a gunshot wound to the mandible leaving a 5 cm boney defect. This defect was reconstructed utilizing preoperative three-dimensional (3D) planning, an accurately pre-bent reconstruction plate, and a novel “triad” construct of autogenous bone graft, demineralized bone matrix, and an osteoprotective membrane. 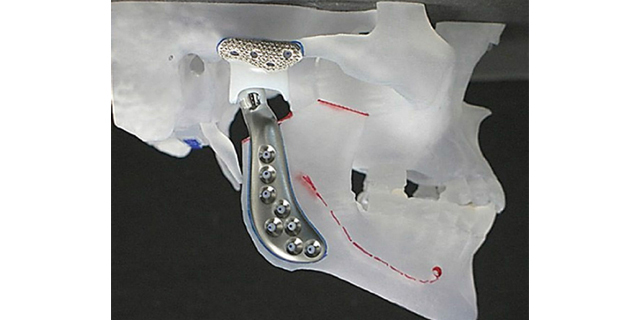 This reconstruction workflow allowed maintenance of the contour of the mandible and bone regeneration while also acting as a barrier to other tissues. 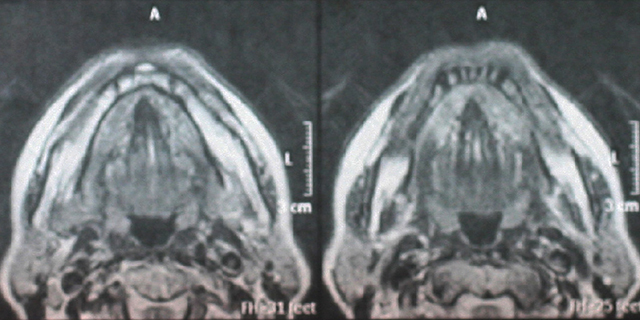 This new technique reduced operative donor site morbidity and decreased surgical time dramatically, allowing the patient to be discharged the same day. The patient has a 5-year follow-up with panorex film and a biopsy of the graft area showing normal cortical bone. This case report illustrates the combination of advanced technology and novel products which can decrease operating time, decrease anesthesia time, increase precision, and most importantly decrease patient morbidity. Linear IgA disease is a rare blistering disease affecting the skin and less often the oral mucosa. 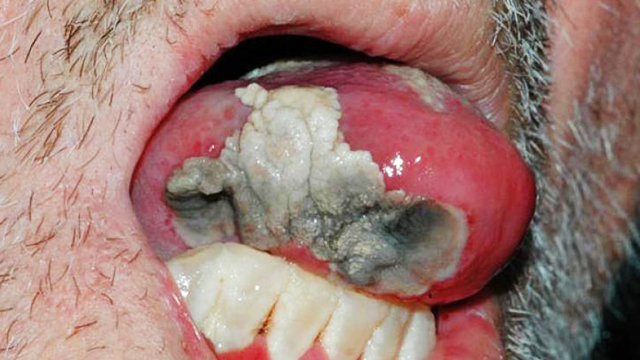 This disease has a varied clinical presentation especially when the disease affects the oral mucosa. Certain drugs, autoimmune diseases, infection, chronic renal insufficiency, and malignancies have been implicated as the etiologic factors of this disease. The gold standard for diagnosis of linear IgA disease is direct immunofluorescence on fresh tissue. The immunofluorescence will demonstrate a homogeneous linear deposition of immunoglobulin A along the basement membrane. Multiple therapeutic agents, including corticosteroids, dapsone, sulfapyridine, and colchicine (either alone or in combination), have been used. The authors report a case of linear IgA disease with ambiguous features of pemphigus and cicatricial pemphigoid. The purpose of this review article is to examine the etiology, clinical properties and treatment alternatives of tooth agenesis. A comprehensive literature review is realized by using widespread database sources. Disorders in early stages of dental formation may cause congenital or developmental absence of teeth. Both genetic and environmental factors are responsible for tooth agenesis. Skeletal and dental anomalies accompany absence of teeth most of the time. Management of tooth agenesis can be realized by either closing or opening the spaces of congenitally missing teeth and by correction of dentoskeletal problems with orthodontic mechanics. Restorative dentistry procedures accompany orthodontic treatment when filling the spaces of missing teeth or when reshaping the teeth substituting missing teeth. As a conclusion, treatment of problems related with mild or severe tooth agenesis requires multidisciplinary treatment approaches. Early diagnoses of congenitally missing teeth and comprehensive treatment planning have great importance in multidisciplinary approach to prevent or reduce complications which cause both aesthetic and functional disorders and decrease quality of life. Chronic sclerosing sialadenitis (CSS) is a chronic inflammatory condition of uncertain etiology, primarily affecting the submandibular glands. It has recently been proposed that CSS belongs to the immunoglobulin G4 (IgG4)-related disease spectrum, although the exact relationship between these two entities requires further elucidation. Our aim is to present a case of bilateral CSS of the sublingual glands and discuss the possible underlying pathogenetic mechanisms. 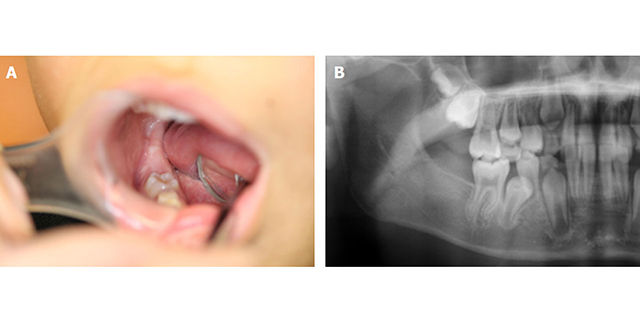 A 66-year-old woman presented with a 7-month history of an asymptomatic firm swelling of the floor of the mouth. Clinically, a diffuse, multinodular swelling of elastic to firm consistency was observed across the sublingual folds bilaterally. 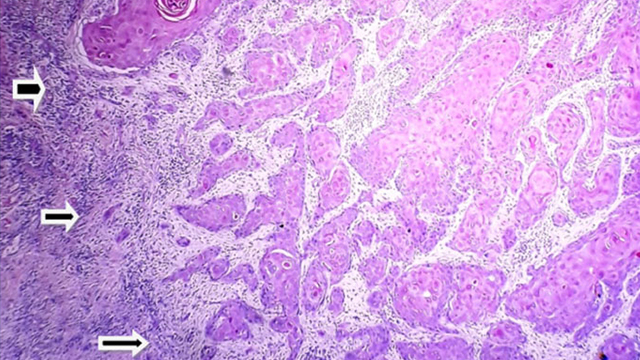 An incisional biopsy revealed a lymphoplasmacytic infiltrate with lymphoid follicle formation, along with acinar degeneration, fibrosclerosis and ductal dilation. Immunohistochemical investigation ruled out lymphoproliferative diseases revealing a polyclonal lymphoplasmacytic population with only a few scattered IgG4-positive plasma cells. IgG4 serum levels were also normal. No treatment was administered with progressive spontaneous resolution of the swelling and no evidence of recurrence at 2 years follow-up. CSS is a benign salivary gland disorder, which, at least in a subset of cases, may represent an IgG4-associated disorder. Therefore, immunohistochemical evaluation of the IgG4/IgG plasma cell ratio and the IgG4 serum levels is a recommended investigation in the diagnostic work-up of CSS cases. Papillon-Lefévre syndrome (PLS) is a very rare autosomal recessive trait characterized by palmoplantar hyperkeratosis and severe generalized early-onset periodontitis leading to premature loss of both primary and permanent dentitions. The etiopathogenesis of the disorder is multifactorial with genetic, immunological, and microbial factors playing a major role. Other significant factors involved are environmental and reduced host defense mechanism. Consanguinity is a contributing factor because of its relevance to clinical genetics. The genetic defect underlying etiology of PLS is mutations of the gene 11q14-q21 encoding for cathepsin C, an enzyme involved in a variety of inflammatory and immune processes. Virulent pathogens and their toxins in the subgingival plaque play a major factor in the initiation and progression of PLS periodontitis. Dysfunction of leukocytes is secondary causative factor. Variable clinical expression, late onset of symptoms, and frequent gene mutations reflect the complexity of the syndrome. Today, over 300 cases been reported in dental and medical literature with more cases discovered among Arabs, Indians, and Africans. About 20%-25% of patients with PLS have increased susceptibility to infections besides overwhelming destructive periodontitis. Management of the disorder directed toward halting periodontal destruction by eliminating the reservoir of causative organisms; using conventional periodontal treatment, oral hygiene instructions, antiseptic mouth rinses; and systemic antibiotic. Skin lesions usually treated with topical application of emollients, keratolytic agents, steroids, and oral retinoid. Any attempt to achieve and preserve healthy oral conditions will improve quality of life in patients with this intriguing syndrome. Ameloblastic fibro-odontoma (AFO) is a rare, benign mixed odontogenic tumor. 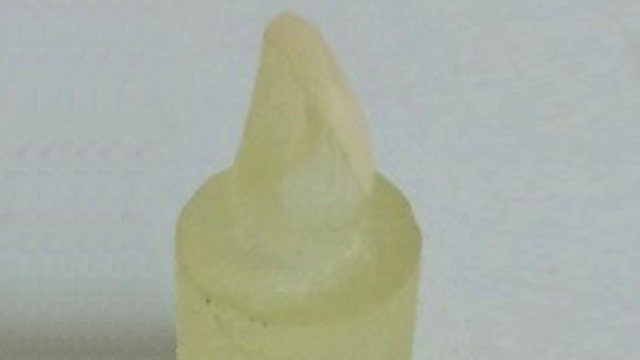 A 9-year-old Japanese boy was referred to Okayama University Hospital in December 2013 for the evaluation of an unerupted tooth in his right lower mandible. A panoramic radiograph showed a well-defined multilocular radiolucent lesion extending from the right first molar to the ramus of the mandibular, containing radiopaque foci. The first molar was impacted by the lesion. The tumor was easily enucleated from the cortical bone, and the follicle of the first molar was removed. The first molar was preserved in the hope that it would erupt to the occlusal plane. At the 3-year follow-up there was no evidence of recurrence, and the right first molar had erupted to the occlusal plane. Aim: The purpose of the study was to evaluate the effect of artificially accelerated aging on marginal fit and color stability of three CAD/CAM materials used to fabricate laminate veneers. Methods: A typodont maxillary central incisor tooth was prepared to receive a ceramic veneer, then duplicated to create 15 epoxy resin teeth equally divided into three groups according to the ceramic used to fabricate laminate veneers. Three groups were established: Group (N) nano-hybrid ceramic (Lava™ Ultimate; 3M ESPE); Group (L) CAD/CAM lithium disilicate glass ceramic block (IPS e.max® CAD; Ivoclar Vivadent); and Group (F) leucite-reinforced glass ceramic block (IPS Empress® CAD; Ivoclar Vivadent). All of the specimens were subjected to artificial aging using a weathering process in a Weather-O-meter for 300 h. Margin fit and color measurements were carried out before and after artificial aging of the laminates. Results: The results for the marginal fit revealed that there was no statistically significant difference between the mean marginal gap distance of the aged and non-aged specimens in the nano-hybrid ceramic. However, lithium disilicate glass ceramic and leucite-reinforced glass ceramic blocks showed a statistically significant change in the marginal gap. For color measurement, Lava™ Ultimate demonstrated a significant decrease in (a*) value while the (L*) and (b*) values did not show a statistically significant change. Conclusion: Within the limitation of this study, it can be concluded that aging the nano-hybrid ceramic had a superior marginal fit and inferior color stability. Aim: To evaluate the methylation of carbonic anhydrase IX (CAIX) promoter and CAIX gene expression in oral cancer and smokers. Methods: The collected oral cells samples were classified in to five groups, with each group containing 15 samples. Group 1, oral squamous cell carcinoma (OSCC); group 2, normal contralateral mucosa (NCM) of patients from group OSCC; group 3, normal mucosa in chronic smokers (CS); group 4, normal mucosa in ex-smokers (ES) in cessation for one year; and group 5, normal mucosa in never-smokers (NS). Samples were evaluated through methylation-specific polymerase chain reaction (PCR) and quantitative PCR. Results: The CAIX gene was methylated in only 20% of samples from group OSCC; in groups NCM, CS, ES and NS, all cases were unmethylated. CAIX expression of group OSCC was lower than in NS (P = 0.005). There was no statistically significant difference between CAIX expression in other groups, NCM and NS (P = 0.285), CS and NS (P = 0.530) and ES and NS (P = 0.068). Conclusion: CAIX methylation is higher in oral cancer and its expression is reduced in the same cases whose methylation is present. 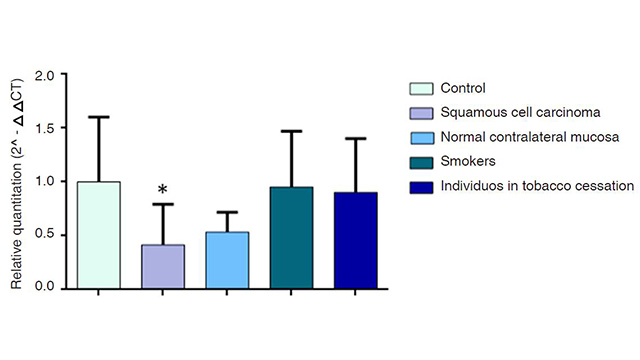 However, the methylation profile and the expression of this gene are not modified in chronic smokers and ex-smokers after one year of smoke cessation. Aim: The present study was carried out to examine the possible differences regarding the periodontal condition between individuals with a gastric cancer history diagnosed by histological examination and healthy individuals. Methods: Sixty-five patients suffered from non-cardia adenocarcinoma diagnosed by histological examination and 60 matched healthy controls were interviewed and clinically examined. Data analysis was performed by χ2 test and logistic regression model to estimate possible correlations regarding the periodontal condition of the mentioned individuals after assessment. The assessment included the following clinical parameters: probing pocket depth, clinical attachment loss, gingival index, and bleeding on probing. Results: Smoking [odds ratio (OR) = 4.448, 95% confidence interval (CI) = 1.818-10.880], gingival inflammation (OR = 2.019, 95% CI = 0.933-11.579) and clinical attachment loss (OR = 5.167, 95% CI = 2.122-12.584), were statistically significant differences between the cases and the controls, after adjustment for smoking and socioeconomic status. Conclusion: Smoking, gingival inflammation, and clinical attachment loss were statistically significantly different between patients who had gastric cancer and healthy individuals. Aim: The aim of this study was to estimate the salivary cortisol levels in patients with oral lichen planus (OLP) and recurrent aphthous stomatitis (RAS) and to correlate it with their psychological profile using the Hospital Anxiety and Depression (HAD) scale. Methods: The study population comprised of 60 patients - 20 with OLP, 20 with RAS and 20 healthy controls. Salivary cortisol levels were assessed using the chemiluminescent immuno assay technique. Anxiety and depression levels were evaluated using the HAD scale. Results: The Kruskal Wallis mean ranks of salivary cortisol level in the OLP and RAS groups were 33.45 and 33.48 respectively and were higher than the mean rank of the control group with 24.58. But this difference was not statistically significant (P = 0.178). The mean ranks of anxiety score in the OLP and RAS groups were 36.48 and 39.50. The mean ranks of depression scores were 41.88 and 35.25 in the OLP and RAS groups respectively. The control group had a statistically significant lower mean ranks for anxiety and depression (P < 0.001). Anxiety and depression scores showed strong positive correlation in both patient groups. Conclusion: The results suggest that anxiety and depression play a role in the pathogenesis of OLP and RAS. The role of salivary cortisol as a biomarker of stress remains to be validated. Patients suffering from psychosomatic diseases such as OLP and RAS need a comprehensive and holistic treatment approach to manage effectively the psychosocial factors involved in the disease process. Charcot-Marie-Tooth disease (CMT) is an inherited heterogeneous group of peripheral nerve disorders with characterized by weakness and sensory loss in the distal limbs. General anesthesia was induced with propofol, rocuronium, and remifentanil. At the end of the surgery, we administered a total of 150 mg sugammadex. 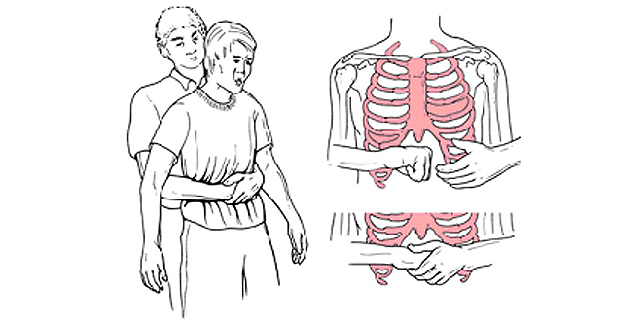 The patient could lift his head and arms, open his eyes. Then we extubated tracheal tube. We successfully used sugammadex in a patient with CMT to reverse rocuronium-induced neuromuscular blockade. 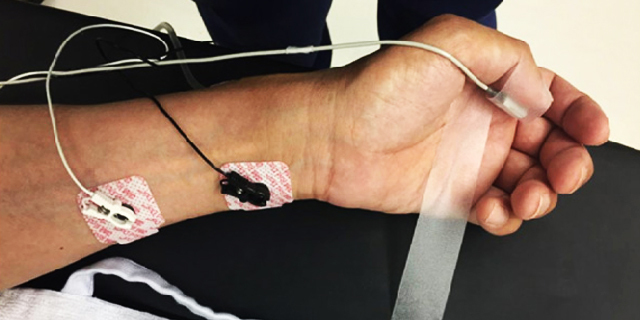 However, muscle relaxation might not be measured accurately in CMT patients. Thus, clinical findings should be referred to in the management of anesthesia. Aim: This study aimed to evaluate the serum ceruloplasmin (CP) level after non-surgical periodontal therapy in chronic periodontitis patients. Methods: A prospective controlled study was conducted on 80 subjects. The study populations were divided into 2 groups: group 1 included chronic periodontitis patients (study group, n = 40), and group 2 included periodontally healthy subjects (control group, n = 40). Blood sample and periodontal clinical parameters, including periodontal pocket depth, clinical attachment level and bleeding on probing, were performed at baseline for both groups. All of the patients with chronic periodontitis (study group) received meticulous scaling and root planing twice weekly for 2 weeks. Four weeks after treatment, the second blood sample and reevaluation of clinical periodontal parameters were done. Results: Baseline serum CP level was significantly higher in chronic periodontitis patients (study group) compared to healthy subjects (control group) (P < 0.001). Concerning the chronic periodontitis group, four weeks after non-surgical periodontal therapy, the mean value of serum CP concentration was significantly decreased (P < 0.001). Conclusion: Non-surgical periodontal therapy has a reducing effect on the serum CP level in chronic periodontitis patients. Serum CP level represents a potential biomarker indicator of the chronic periodontitis disease. Aim: In the management of patients with discolored teeth, would home bleaching alone or in combination with in-office bleaching give better tooth color stability than in-office bleaching? This study aimed to test the effect of different bleaching techniques on color change, stability, and hypersensitivity. Methods: A total of 21 patients were collected and randomly divided into 3 equal groups (n = 7), the first group in-office treatment with 25% hydrogen peroxide, the second group at-home bleaching with 9.5% bleaching treatment), and the third group in-office and at-home as a combined treatment. Testing for color stability was completed; at baseline, 1 day after, 1 week after, 1 month after, and 6 months after treatment using the VITA Easyshade® spectrophotometer. Testing for hypersensitivity was completed; immediately after treatment, 24 h after, 48 h after, and 1 week after treatment using a visual analog scale. Results: The current study found that there was no significant difference between mean values and standard deviation of the three bleaching techniques regarding color change (∆E) and stability in follow-up periods; hypersensitivity faded for all tested groups on a follow-up period of seven days. Conclusion: The different tested bleaching techniques showed similar clinical efficiencies in a follow-up period of 6 months. Also, the different tested techniques showed equal color stability. 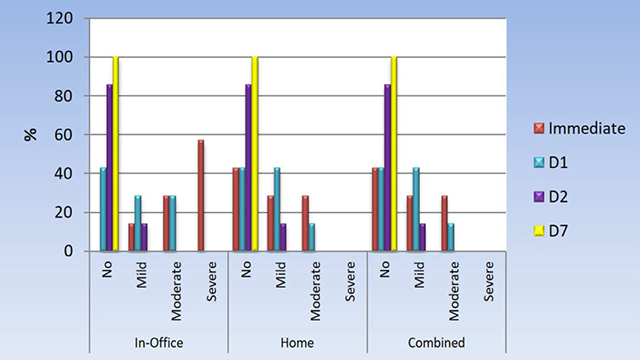 The different tested techniques presented a similar degree of hypersensitivity which faded in the 7 days follow-up. Aim: Oral squamous cell carcinoma (OSCC) is a major health problem in Sri Lanka. Tumor-node-metastasis (TNM) staging system is the tool which is used to determine the extent of surgery in patients with OSCC. However, some patients may receive over-treatment with TNM staging. Mast cells can be found in the oral mucosa. Mast cells secrete different angiogenic factors stimulating angiogenesis which is important in metastasis of tumors. This study aimed to evaluate the mast cell density (MCD) and micro-vessel density (MVD) in OSCC and correlate it with nodal metastasis. Methods: The study sample consisted of one hundred OSCC specimens from patients who were treated surgically with both local excision of the tumor and neck dissections. The sections with OSCC present in achieved biopsies were evaluated for MCD and MVD using toluidine blue stain and a vascular marker (polyclonal rabbit anti-human von Willebrand factor) respectively. The correlation between MCD and MVD with nodal metastasis was statistically evaluated using point bi-serial correlation test. Results: There was a statistically significant correlation between MCD and nodal metastasis (P = 0.003) and MVD and nodal metastasis (P ≤ 0.000). These results indicate that MCD and MVD are significantly higher in OSCC with nodal metastasis. In addition, there was a weak positive correlation with MCD and MVD (r = 0.244) (Linear regression and Pearson correlation test). Higher statistically significant MCDs were observed in the buccal mucosal OSCC compared to OSCC of the tongue (n = 100, P = 0.023). There were no statistically significant differences when MCD and MVD were correlated with age, gender or degree of differentiation of the tumor. Conclusion: Significantly, high MCD and MVD at the advancing front of the OSCC might be used to identify tumors that present with nodal metastasis. With further studies, this finding could be applied to determine the extent of surgery required for patients with OSCC. Since the turn of the century a paradigm shift has challenged the centuries old tradition of non-surgical treatment for condylar fractures. The advent of functionally stable osteosynthesis introduced into condylar traumatology in the 1980ies step by step widened out the indications for surgical treatment, paralleled also by improvement in computerized tomography diagnostics and more recently by continuous refinement of indication-specific osteosynthesis materials, with three-dimensional-plates for the condylar base and neck and resorbable materials for the condylar head being the latest developments. Over the last decades, a series of new approaches was introduced, too, to cope with the specific demands for open reduction and rigid internal fixation (ORIF) in the different fracture locations, which according to the recent consensus based Arbeitsgemeinschaft für Osteosynthese comprehensive injury automatic classifier (AOCOIAC) classification are now defined as fractures of the condylar base, condylar neck and condylar head. By now even fractures of the condylar head, treated surgically by Rasse already in 1992, have moved into the focus of surgical interest and ORIF by now is far from being “experimental”, as dubbed only a decade ago. According to recent consensus (International Bone Research Association, 2012) and based on improved evidence, ORIF may now be considered as the golden standard for both displaced or dislocated condylar base and neck fractures in adults. Endoscopic approaches should be considered for base fractures with lateral displacement. Meanwhile, there is a growing tendency to perform ORIF in condylar head fractures and severely displaced or dislocated fractures in younger children with mixed dentition. Alfred Stille said, “Medicine, like all knowledge has a past as well as a present and a future…in that past is the soil out of which improvement must grow.” This original paper will review how past successes and failures have led to the development of improved temporomandibular joint replacement devices. Future considerations and challenges will be presented. Generations of apex locators: which generation are we in? Endometrics is one of the key factors responsible for the success of endodontic therapy. Electronic determination of working length has gained enormous popularity, owing to its extreme accuracy and predictability. The literature is flooded with the self-proclaimed generations of the apex locators. This article is aimed at concise description of the actual scientific rationale behind the generations in order to diminish the related perplexity.